Today’s Flash Back Friday comes from Episode 123, from January 2013. It’s a fact – many people suffer a mid-life crisis between the ages of 40 and 60. It is a transition period during which one realizes their life may be half over and they reflect on their accomplishments in life, their regrets, and what they would still like to do. Jason Hartman interviews author, Michael Cosgrove, who endured what he called a three-quarter life crisis at the age of 60 that led to his book, Imperfect Passage. Michael had a great life that he had worked hard to achieve – a beautiful family, a successful career, and a lovely home in southern California with views of the Pacific Ocean. But Michael was not taking to the idea of old age well. He wanted to establish a legacy for his family and decided to “shake things up” by embarking on a long and dangerous adventure to attempt to sail around the world. Michael was not prepared for the rigors of such an adventure and suffered many hardships and mental and emotional stress, including a dangerous crew member with a personality disorder. Michael talks about the biggest surprise that came from this attempt, the psychological impact. On the ocean, he noted, you lose all of your control, which required him to adapt to the environmental conditions and get a grip on his attitude. As Michael says, “You can’t change the direction of the wind, but you can adjust your sails.” Another lesson he learned was to recognize the difference between a temporary inconvenience and a real problem. Listen at: www.HolisticSurvival.com for more about Michael’s rough voyage that ultimately led to some of the best lessons about life. 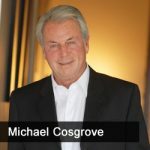 Michael Cosgrove earned his BS from Michigan State University and his Masters in psychology from Western Michigan University. He has been a teacher, a coach, a psychologist (MA), a model and an actor. For the past 32 years, he has been masquerading as an insurance agent. The writing process for his book was an emotional experience for him because he has always battled debilitating Dyslexia. First, he hears the words in his head, then feels them in his heart, and they come out of his fingertips onto the keys of his computer. His hope is that his message in Imperfect Passage will add value to the lives of his readers. He realized it’s not about him, or the book, but what he can offer the audience as a result of his experience. He hopes the readers will find meaning in the power of success, as well as the lessons of defeat.